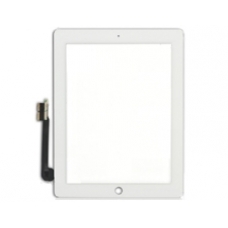 Buy the iPad 3rd generation digitizer touch screen replacement in white. If you have cracked or smashed your iPad screen and the retina display is still working without issue, you will only need to replace the touch screen digtiser glass. This screen is suitable for the iPad 3 / iPad 3rd Generation. This is not an simple repair for someone who has no technical skills with disassembling the Apple iPad. * Original iPad 3 Spare Part.We also stock adhesive strips allowing you to mount the glass digitizer to the iPad 3 rear case assembly. Order iPad 3 Adhesive Glass Touch Screen Digitizer Mounts.